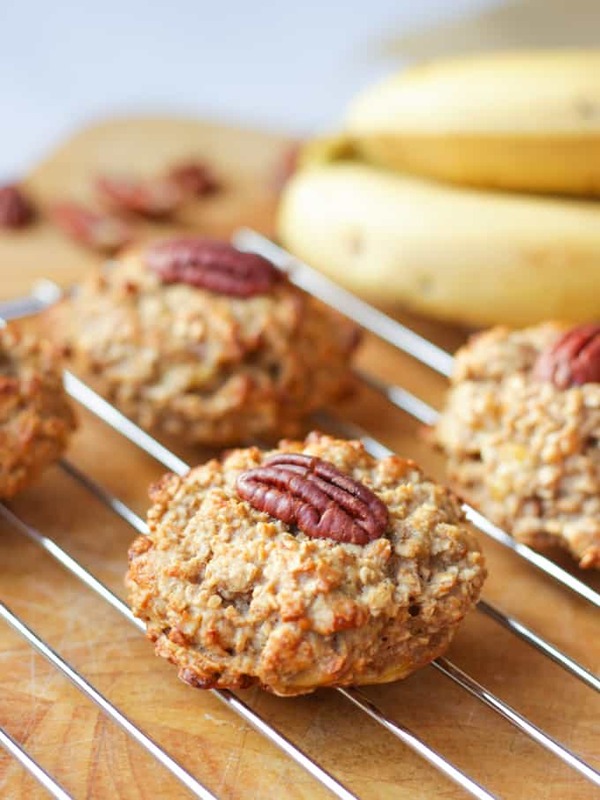 These Easy Breakfast Cookies with Banana and Peanut Butter are the perfect healthy start to your morning. Simple to make, healthy, high in protein, gluten free, sugar free and great for kids too. This post was sponsored by Belling. They asked me to come up with a selection of recipes, using one of their nifty new ovens. Thanks, as always, for your support. Morning 2018! I don’t mean to be a total hashtag NERD (I am) but I’m actually pretty keen on January. For me, the fresh start, blank page of a new year let’s me forgive the cold grey mornings. I’m not big on resolutions, I mean, if I didn’t change on 1st January for the last 36 years, it’s not going to start now. However, after the overindulgence of December I am craving some good, nourishing food that isn’t based on cheese or chocolate. G&H are back at school and so breakfast making time is limited. I played around a bit with Breakfast Cookies with Banana last year, and this is my basic recipe which I love for it’s simplicity. Plus, cookies for breakfast? RIGHT? What is in Breakfast Cookies? Have you seen how expensive store bought breakfast cookies or breakfast biscuits are? Crazy plus they generally seem to contain a lot of sugar. Yes, easy to grab on the go, but this recipe is so quick, and you’ll know exactly what is in your breakfast cookies. 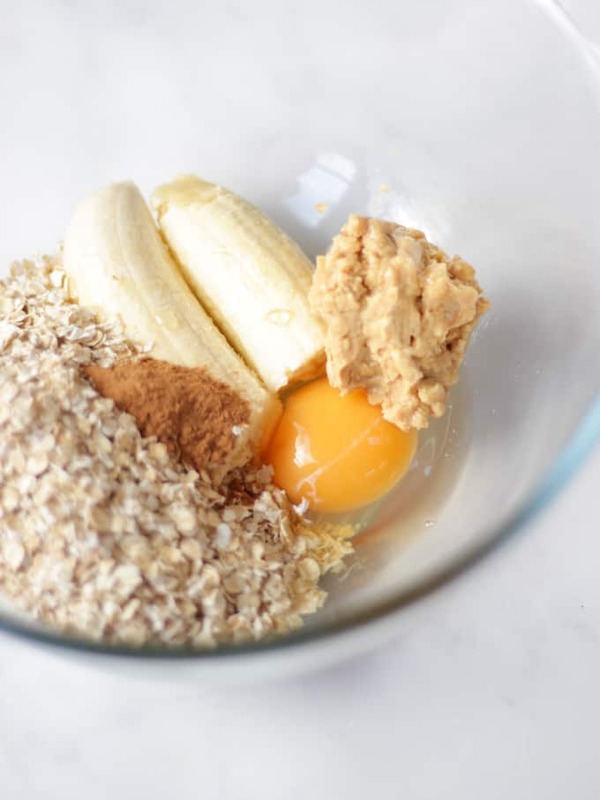 My recipe uses very ripe (in fact, the blacker the better) banana, egg, oats (or oatmeal if you’re in the USA) plus peanut butter (makes everything better obviously). I add a little cinnamon and honey, plus pecans on top (to look pretty – cannot help myself). There’s no flour in this recipe, so if you’re eating gluten free you’re good to go. There’s also no added refined sugar (you can omit the honey if you prefer). 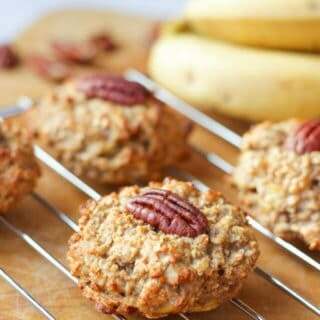 How to make Breakfast Cookies with Banana? It’s so simple to make these little bites. 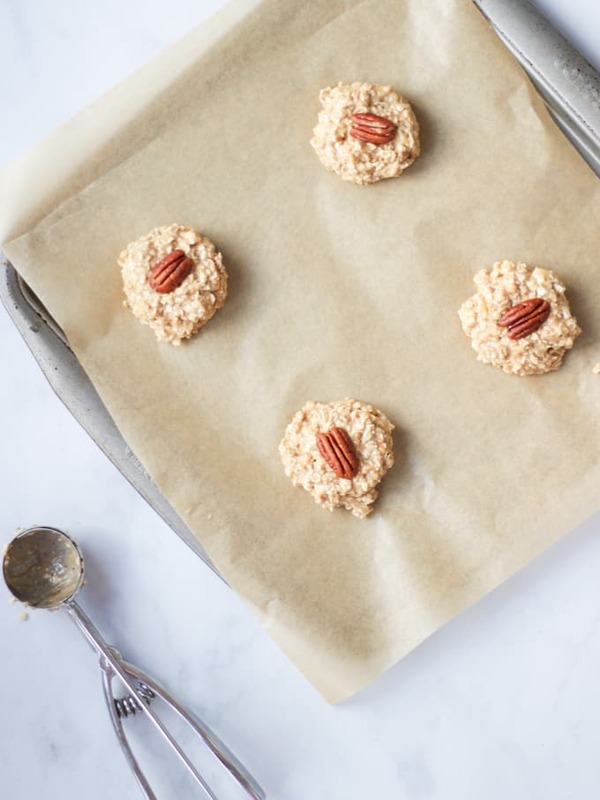 Throw everything in a bowl, mush up (technical term), scoop out onto a baking paper lined baking tray, top with a pecan and bake for 20 minutes – done. I like to use an ice cream scoop to scoop this mixture into four neat bundles. You don’t need to but it is certainly helpful. Bake them until they are golden topped and cooked through. Be sure to use very ripe bananas. Did you know that ripe bananas have so much more natural sweetness than very yellow bananas? When we have bananas we haven’t eaten, I just pop them into the freezer for whenever I need a very ripe banana. Saving food waste too, win win. This recipe makes four cookies. I tend to have two for breakfast then eat the next two the following day. They’ll be good the next day if stored in an airtight container. If they are a little dry, you can microwave them for about 30 seconds to refresh them. 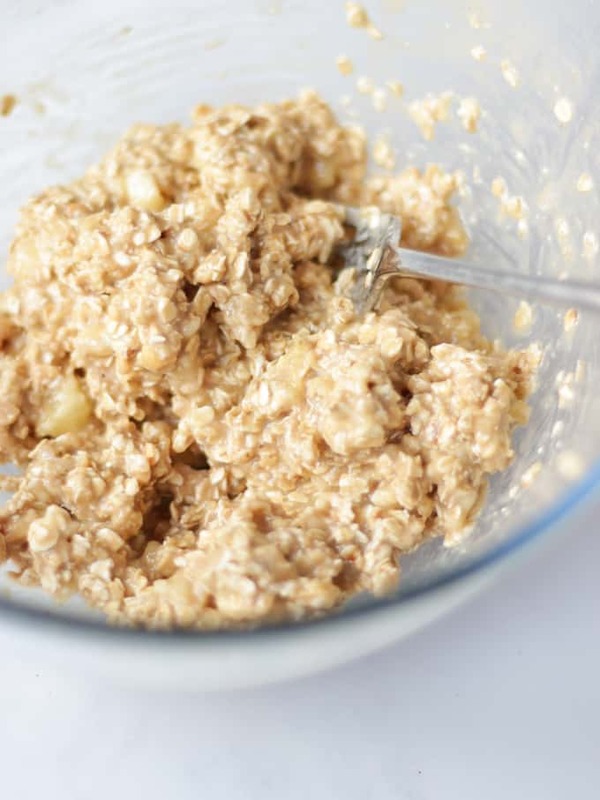 Want to make bigger batches of breakfast cookies? You could freeze the cooked cookies and just bring out two to defrost the night before you’ll eat them. This works well. I baked the cookies in my new Belling oven which I’ve mentioned in my recent recipes. They asked me to create some recipes for their site and this is one of them. Smeary oven window alert, no judgement here right? Better to have an oven well loved and used I say. 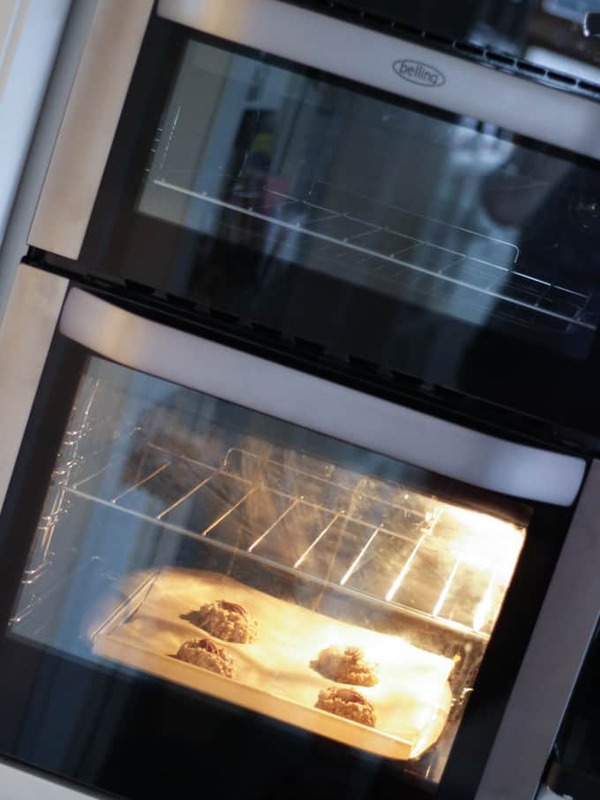 The cookies cooked really well in the Belling double oven, it’s quick to come up to temperature too, ideal for busy morning breakfast bakes. 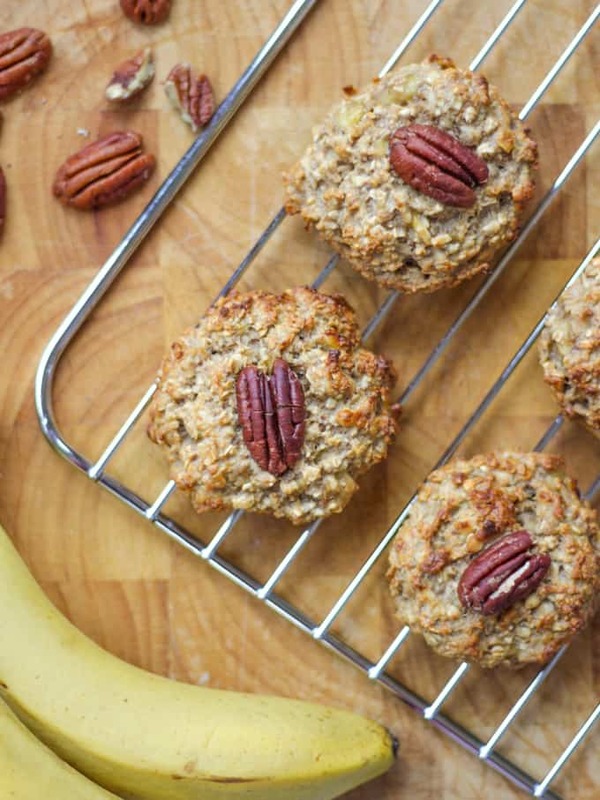 I’d love to know how you got on and what you thought of the recipe if you make these Breakfast Cookies with Banana. Please rate the recipe and leave me a comment below if you do. Put everything apart from the pecan nuts into a bowl and mash and mix together very well. Scoop out into four cookie shapes on a lined baking tray. Top with a pecan and bake for 20 minutes. Disclosure: This post was sponsored by Belling. As always all opinions are my own. This post contains affiliate links. We’re going to try these in the morning.